Turnford Pipelines offer a fast and effective drain cleaning and clearing service for works across the Greater London area, for everything from emergency call-outs for blocked drains, one-off drain cleans and full planned drainage maintenance programmes. Adopting a program of regular pre-planned drainage cleansing and maintenance with Turnford Pipeliness will reduce emergency drain repair call outs and expensive sewer renovation. It means that your drains will be cleaned and inspected regularly, any issues found can be resolved before they turn into major problems. Preventative maintenance is cost-effective, and can be scheduled on a program to suit your business, rather than the headache of a drainage emergency. Within the Greater London Area our Quick Response Vehicles are able to deal with all aspects of drainage problems and emergencies. Blockages are cleared using high-pressure water jetting, together with follow up investigation incorporating colour CCTV surveys in jpeg format, with written reports to accompany. Sewage contaminating your site, causing health issues and environmental problems is one headache you really don't need. Often surface water drains run into the foul sewer system, so ensuring that all the pipes are kept clear of debris and obstructions to keep them free flowing on your site is good forward planning. Routine jetting by Turnford Pipelines is the easiest way to prevent avoidable flooding and blockages in the sewers within your site and makes for good housekeeping and sewer maintenance. Jetting the sewer pipes forces silt and debris forward until it arrives at the next downstream manhole or access point. 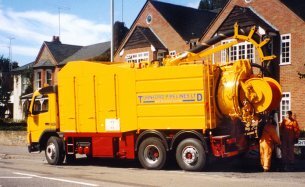 Here the Vaccumming system takes over to remove any excess silt, debris and liquids that have accumulated into the lorry's debris tank for disposal. This service is also effective for interceptors, septic tanks, chambers and soakaways. A pre-planned maintenance contract with Turnford pipelines is the simplest way to make sure all this gets done regularly, leaving you with one less thing to thing about . Our Vactor teams will visit according to a pre-arranged schedule, check, jet and vacuum the sewers. As both part of our program of preventative maintenance or post blockage sewer and drainage clearance Turnford Pipelines will perform a CCTV survey. CCTV survey technology is the best and most cost effective way to inspect drains and sewers. Regardless of whether you already have a drainage problem or are just keen to avoid one in the future, a Turnford Pipelines CCTV drain or sewer survey is the best way to get an instant, detailed look at the condition of your underground drains. Other Sewer and drainage remedial works. Industrial boiler plumbing, incorporating maintenance and certification. Arcroft Building, Marsh Lane, Ware, Hertfordshire. United Kingdom. SG12 9QN. © copyright Turnford Pipelines Ltd 2011 - all rights reserved.